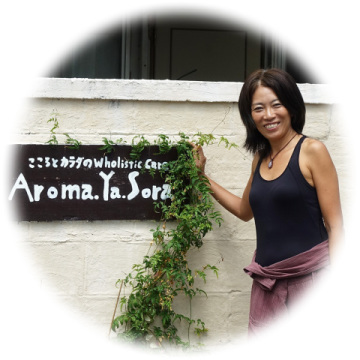 Aroma.Ya.Sora is a private wholistic healing and retreat clinic. We are located on the beautiful island of Ishigaki, an island a part of the Yaeyama island group in Okinawa prefecture, Japan. Ishigaki island is surrounded by the natural beauty of white sand beaches,pristine blue ocean, and beautiful coral. People who come to the Yaeyama region tend to stay for a long time.This is because the Yaeyama region has a strong natural power. so people are able to return to their true natural state. "Wholistic Aromatherapy", "Remedial Massage", "Reiki Healing" and "Wholistic Counseling". *The founder was inclined to add "W" to Holistic bringing full attention to the "whole" in light of today's trend of the rigid format of branding "holistic". "Wholistic" by nature itself is inherently dynamic,ever-changing and all-encompassing to include metaconditions and to implement wholistic therapies must address updated situation. Therapist Akiko has 15years of experience is total 11years in Japan and 4years in Australia. Thought the years she has gainedsive knowledge of the human body. Akiko acquired a Diploma of Remedial Massage in Australia. (including human anatomy, pathology and nutrition). Wholistic Aromatherapy and Reiki Healing applied masterfully with the proper care and the appropriate treatment for the client's body and mind. Treatment begins with wholistic counseling, experienced posture analysis and selecting the appropriate essential oil combination to heal the mind,body and sprit. to enhance every aspect of the treatment. Akiko is known among peers, clients and students for her intensely focused therapies and light-hearted, quirky personality. Akiko is pioneer striving to add more value and benefits toward treatment where none existed previously.